The industry faces a range of outcomes from city-led bans on older diesels “but in almost all scenarios automakers will be hurt,” one analyst said. Audi Executive Vice President Technical Development Horst Glaser came to a meeting with journalists at the company's annual results conference in March armed with charts showing air pollution in Germany's cities was improving. "Air quality is getting better and better, but the discussion is getting worse and worse," Glaser said. There is huge frustration right now at automakers such as Audi's parent, Volkswagen Group, that their costly upgrades to ensure new diesel cars comply with tougher European emissions regulations are doing nothing to alter consumer belief that diesel is dirty and will soon be legislated out of existence. The latest blow to the fuel’s reputation was the Feb. 28 ruling by Germany's highest federal administrative court that cities could ban diesel cars to help reduce pollution. "The industry has a huge problem," Bernstein Research analyst Max Warburton said in a note. "The range of outcomes from city bans is wide, but in almost all scenarios automakers will be hurt." Consumers in Germany are turning away from diesels at an accelerated rate. The share of cars sold with the powertrain in January was 33 percent, down from 45 percent during the same month in 2017. With a few exceptions, diesel's share is falling in countries across Europe. Last year, European demand for diesels slipped 7.9 percent to 6.77 million vehicles, resulting in a 43.8 percent share. That's down from a peak of 54.9 percent in 2011, according to figures from market researcher JATO Dynamics. Sales will fall further, analysts believe. LMC Automotive predicts in its worst-case scenario that Germany's diesel share will sink to 28 percent by 2018. For Europe overall, it expects a slower decline, forecasting the share will drop to 28 percent by 2025. In the UK, Europe's second-largest car market after Germany, the diesel share for passenger cars stood at 35 percent in February, down from 45 percent during the same month a year earlier. That figure is expected to be 15 percent by 2025, a recent study by Britain's Aston University predicted. 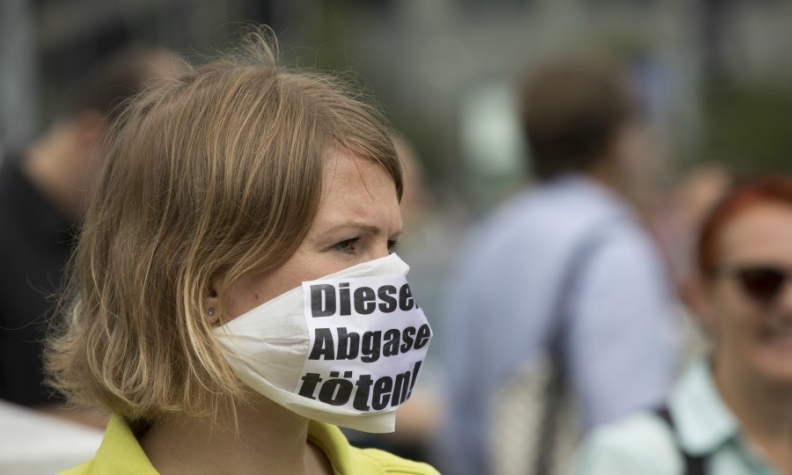 Diesel emissions have been a hot political issue in Germany. 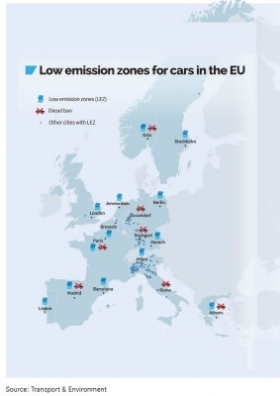 Almost every week car buyers are being bombarded with news of potential restrictions on diesels as European cities look to cut pollution, with an emphasis on slashing harmful nitrogen oxides (NOx) that are more prevalent in diesel. Officials in Milan, Italy, want to bring forward by five years to 2025 a total ban of diesels from the city, La Repubblica newspaper reported in March. That follows the announcement by Rome Mayor Virginia Raggi in February that she wants to ban diesels from the city by 2024. 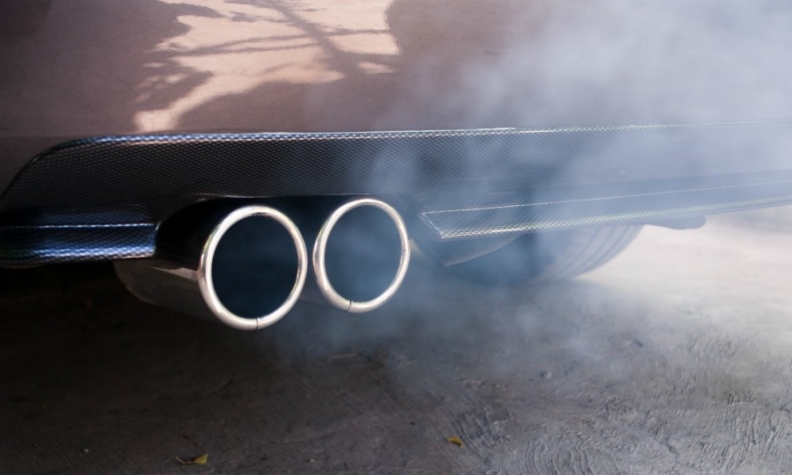 In addition, a committee of UK legislators demanded last month that the government bring forward its 2040 date for a ban on conventional internal combustion engines and called for automakers to pay into a clean air fund. Auto executives said that the steady stream of bad news is damaging sales. "Everyone wants mobility, but what they don't know is, if I purchase a car now, can I drive it into cities? Does this car maintain its residual value?" Hyundai Europe Chief Operating Officer Thomas Schmid told Automotive News Europe. Some believe the end of the fuel is near. "Diesel is dead," said a senior executive at a major European Tier 1 supplier, who asked to remain anonymous. One major supplier of diesel engine technology already has an idea of when the switch will take place: Continental says 2023 is likely to be the year when the last pure combustion engine platform will be introduced in Europe. "It's very clear diesel is on the way out if you're a small manufacturer," Nissan Europe Vice President of Product Planning Ponz Pandikuthira, told ANE. "We have a 4 percent market share. We can see a path to no diesel." Those automakers least exposed to diesel are gambling that dropping it altogether will generate positive publicity around alternative powertrains. Toyota has said it will phase out diesels from its European passenger car lineup this year and focus on its gasoline-electric hybrids instead. Just 7 percent of Toyota's European sales were diesels last year, according to data from JATO, the lowest of any volume automaker. Aston Martin CEO and former top Nissan executive Andy Palmer won’t install a diesel in the supercar maker's forthcoming SUV. "My belief for a long time is that diesel’s life is limited. Ultimately, it's dead," he said. Even those more exposed to diesel are starting to back away. Volvo has one of the highest exposures at 78 percent of its European sales in 2017, but the automaker has said it has developed its last diesel engine. Fiat Chrysler Automobiles plans to eliminate the powertrain from its passenger cars by 2022, the Financial Times reported in February. Ultimately, however, the European car industry cannot back away from diesel. Powertrains that use the fuel are 20 percent to 30 percent more efficient than their gasoline counterparts. That makes diesel crucial to reaching the EU's fleet emissions target for CO2 of 95 grams per kilometer by 2021. Last year the average CO2 emitted by new cars sold in Europe rose to 118.1g/km from 117.8g.km in 2016, JATO's figures show. Europe's first year-on-year increase in average CO2 in a decade happened because of slumping diesel sales coupled with rising demand for SUVs, according to JATO. 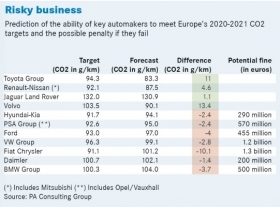 "It's clear that the decline in diesel will lead to most of the major automakers missing their European CO2 targets, which is likely to cost them billions of euros in fines by 2021," Thomas Goettle, head of automotive at PA Consulting Group, said. Missing the target would cost the VW brand 140 million euros a day, brand CEO Herbert Diess revealed during the company's financial results conference last month. Diess's sales chief, Juergen Stackmann, recently told Reuters: "We are required to be compliant [with EU targets]. A significantly lower mix of diesels is not helpful." Audi CEO Rupert Stadler described the task of meeting the targets as "Herculean" but both Stadler and Diess said they would succeed. "Penalties are not an option for us," Stadler added. Cutting the number of higher CO2 models is one option that Ford is considering to help it reach its EU target, a source at the automaker told Reuters. VW and Audi are among those hoping to launch a range of electric or electrified cars by 2021, but their sales might not be enough to tip the balance on CO2. Despite all of the negative publicity around diesels, the market share for electrified cars rose to just 5 percent of total European car sales last year from 3 percent in 2016, according to JATO. Toyota's hybrids accounted for the majority of the sales in the electrified sector while JATO described growth of full-electric cars as "meager." Automakers are still reliant on government incentives to help push sales of plug-in cars. Cutting those perks could hurt carmakers betting on electric models to help them reach their CO2 goals. "If governments will not support electrified cars, we will have to look to our price positioning, to try and balance our lineup. This will have a heavy impact on our balance sheet," Hyundai Europe Vice President of Marketing and Product Andreas-Christoph Hofmann said. Another financial headache is the falling resale value of diesel cars. In Germany, the residual value of a 3-year-old diesel fell 3.4 percentage points to 52.6 percent of its original list price at the end of 2017 compared to the year before, according to the DAT Diesel Barometer, run by the German automakers association, VDA. Ratings agency Moody's said last month that the threat of diesel bans in some German cities will further diminish second-hand values and cause inventory levels of used vehicles to rise. "Falling demand for diesel vehicles will mean that residual values may fall substantially short of initial expectations," Moody's said in a note. Under most leasing and financing contracts, automotive banks and dealerships guarantee the residual value of the used car when customers return the vehicle upon contract expiry. About 75 percent of German new registrations are supported by a financing contract, Moody’s said. The fall in diesel sales also affects manufacturing. "I care passionately [about falling sales] because I have a very large diesel plant," Ford of Britain Managing Director Andy Barratt said. Ford's plant in Dagenham, England, specializes in diesels for light commercial vehicles, which has shielded it from diesel declines, but the factory is about to add production of diesels for Ford's passenger cars. The country's biggest manufacturing union, Unite, is so worried about the diesel decline that it called on Ford to switch production at the plant to either electric cars or battery packs. Automakers have also been spending cash to increase gasoline engine capacity as quickly as possible to meet rising demand. "All the investment decisions to increase the capacity of our gasoline engines have been made over the last 18 months. You didn't hear about it, but we did it," PSA Group CEO Carlos Tavares said. "Is it easy? No, it's hell. Our manufacturing guys are working day and night to make this happen." Although VW Group has been at the center of the diesel crisis since it admitted in 2015 to cheating emissions tests to make the powertrain appear cleaner than it was -- sparking was has become widely known as Dieselgate -- the automaker remains the most bullish about diesel's future. "We have falling sales now, but I expect a renaissance in diesel in the next few years and volumes will increase," VW Group CEO Matthias Mueller said at this year's Geneva auto show. VW will launch an all-new diesel engine next year and foresees the fuel remaining popular, particularly in larger cars. "I think on heavier cars such as SUVs we will see diesel in the future," said Matthias Rabe, who is r&d boss at VW Group's Spanish subsidiary, Seat. He points to Euro 7 emissions standards, which take effect in 2023, that bring parity to diesel and gasoline in terms of allowable pollutants. "If we have the same standards for both, and we have real-driving emissions, why not continue with the diesel, which, from an efficiency point of view, is better than gasoline?" he said. VW is right, argues Christoph Stuermer, global lead analyst for PwC Autofacts. "The decline we currently see is an expression of panic. It won't be sustained." Sales will continue to fall, just not as fast. "It's going to come back to the decline slope it's been following for the last three years," he said. Some markets aren't shedding diesel sales at the same rate. Italy, for example, saw diesel demand rise in 2017, resulting in a 57 percent share. In addition, automakers with a high percentage of light commercial vehicle sales, such as Ford and PSA, will be able use the scale afforded by its LCV production to continue to offer the same or similar engines for a declining car market without too much additional expense. At the moment, there's no good alternative to diesel for LCVs, something that governments and cities currently recognize. The German court's decision to allow diesel car bans exempted diesel-powered commercial vehicles, for example. It is clear, however, that diesel-powered cars will largely become an expensive luxury. Audi has already introduced diesels that comply with the tough new Euro 6d emissions standards, which take effect in September, on its new A8, A7 and A6 cars. But this comes at a price. "It's a real expensive technology – sensors, catalysts, etc. It costs a lot," Audi's Glaser said. It will take a lot of hard work to persuade car buyers and elected officials in Europe's cities that diesels are clean. However, LMC Automotive global powertrain analyst Al Bedwell said there could be some good that comes from this period of crisis. "Dieselgate might one day be seen as the savior of diesel, having prompted legislation that finally makes diesel truly clean," Bedwell said. "Time will tell."